In April 2018, I was invited to partake in the COTTAGE Digital Arts Incubator and Collaborative Arts Festival in Gros Morne National Park — a UNESCO world heritage site on Newfoundland’s west coast. 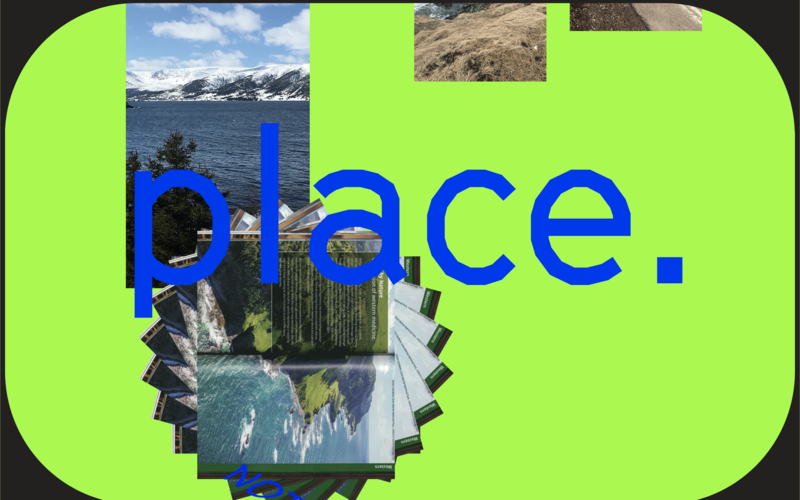 Over the course of one week, six digital artists were brought together to explore the stunning surroundings, meet with community members and local organizers, and to create work responding to the park itself. The group was comprised of designers, writers, sound artists, photographers and visual artists, and I was lucky enough to spend the trip learning about their diverse practices. While we spent most of our time making and exploring, mid-week each of us gave an artist talk to the community and answered questions about our practices. Then, at the end of the week, fifteen more regional artists joined in for an all-night art-making festival that was open to locals. For my piece, I considered my behaviour before leaving for the trip. I had searched Google Images, stalked down the street where I’d be staying via Google Street View, searched the National Film Board’s archives, perused Trip Advisor reviews, and checked the weather via the Weather App weeks in advance. I realized that I tried to quell my anxiety about the new people and surroundings I would encounter by learning as much I could about Gros Morne before leaving— a deluded attempt to try to predict the unpredictable. However, the digital landscape we are currently confronted with is so vast that one can fool oneself into thinking they know a place without ever actually having been there. 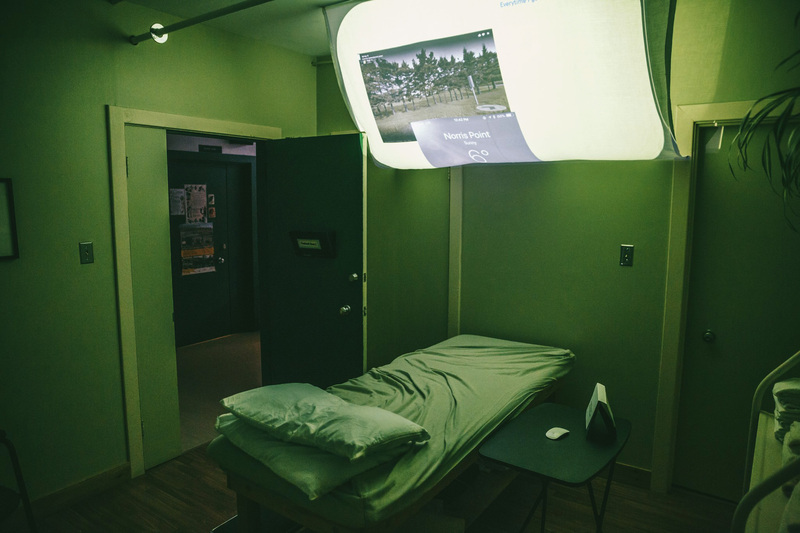 My installation was ultimately a meditation on the anxiety surrounding going somewhere new, as well as on my attempts to “know” a place through digital means. I wrote a prose poem on the subject over the course of the incubator which I translated into a interactive scroll-based piece. 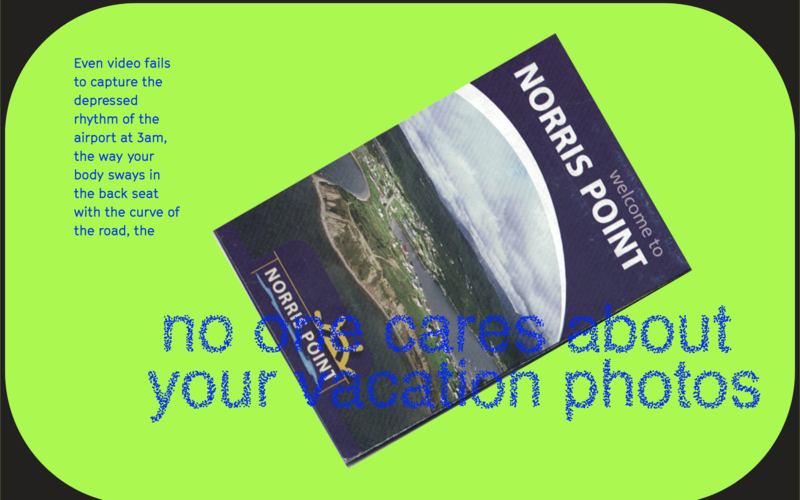 I then incorporated bizarre gifs featuring the digital and two-dimensional means I used to learn about Gros Morne. I hoped that bombarding my audience with animated imagery and text—as well as using jarring colours like HTML blue and lime green—would recreate the anxiety I felt while researching for the trip. During the final festival, I presented the piece by projecting it at a white sheet hung so that it curves away from the wall. 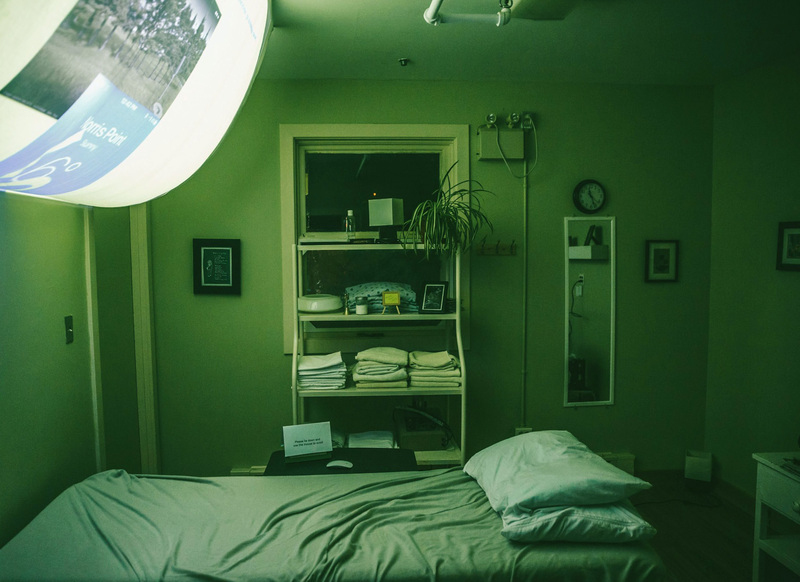 I then positioned a bed under the sheet so that visitors would have to lie down beneath the piece in order to view it, ultimately creating a more immersive and novel experience. Visitors then scrolled through the website using the provided mouse, moving forward and backward through the prose and associated images at their own pace. Finally, I played an audio track of my computer reading the Gros Morne National Park Wikipedia Page. 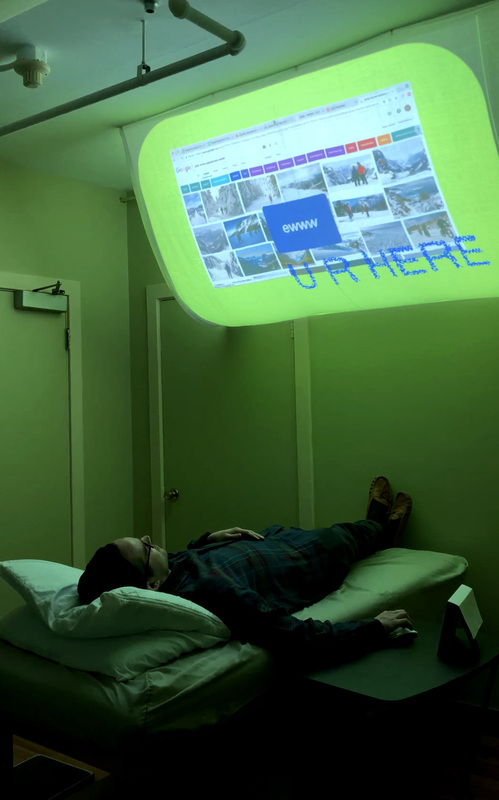 In addition to creating more anxiety-inducing stimulation, I felt that the robotic voice and mispronunciations would highlight the foolishness of trying to know a place via the internet. A pixel can’t take up space. A map hasn’t tread every path by foot. 1000 brochures only make up a cubic foot of the Tablelands.